Scarp's Smokin' Hot! Sauce is made only with Bhut Jolokia Peppers (Ghost Peppers) This is not a mix of peppers just the real deal. 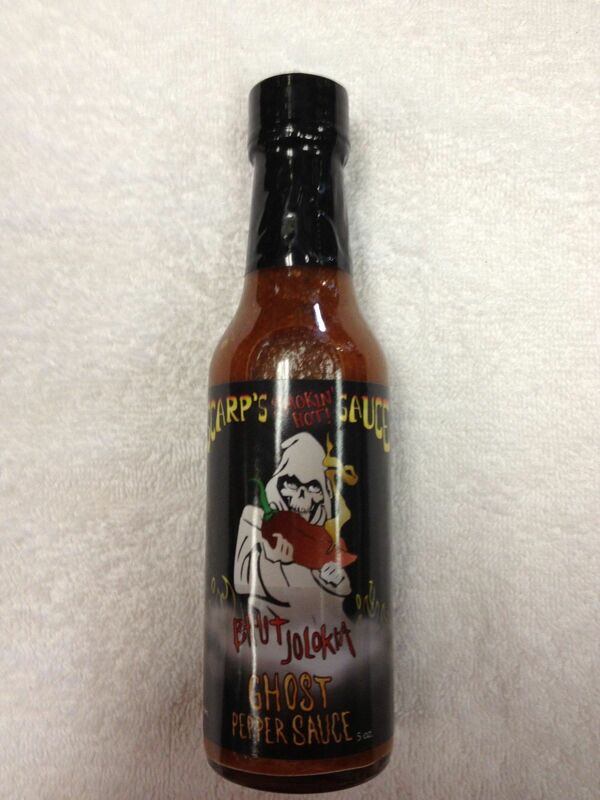 This Hot Sauce is the newest addition to our collection and one of the Hottest hot sauce on the market today!!! Made with the hottest pepper in the world, the Bhut Jolokia or "ghost pepper", Scarp's Gourmet Ghost Pepper Sauce should be used as a food additive (in cooking, and on food one toothpick drop at a time) the warnings on the label are serious. Keep away from eyes, children and pets, and don't consume if you have heart or respiratory problems. The main ingredient is the Bhut Jolokia pepper, making this hot sauce MUCH hotter than most others on the market today! Consider yourself warned: Eat Scarp's Smokin' Hot! Sauce at your own risk! The heat from Scarp's Smokin' Hot! Sauce is strictly from the Ghost Peppers that are well over 1,000,000 Scoville units! We do not find the need to put nasty, bitter tasting extract in our sauces!